HANS® places your health in your hands. 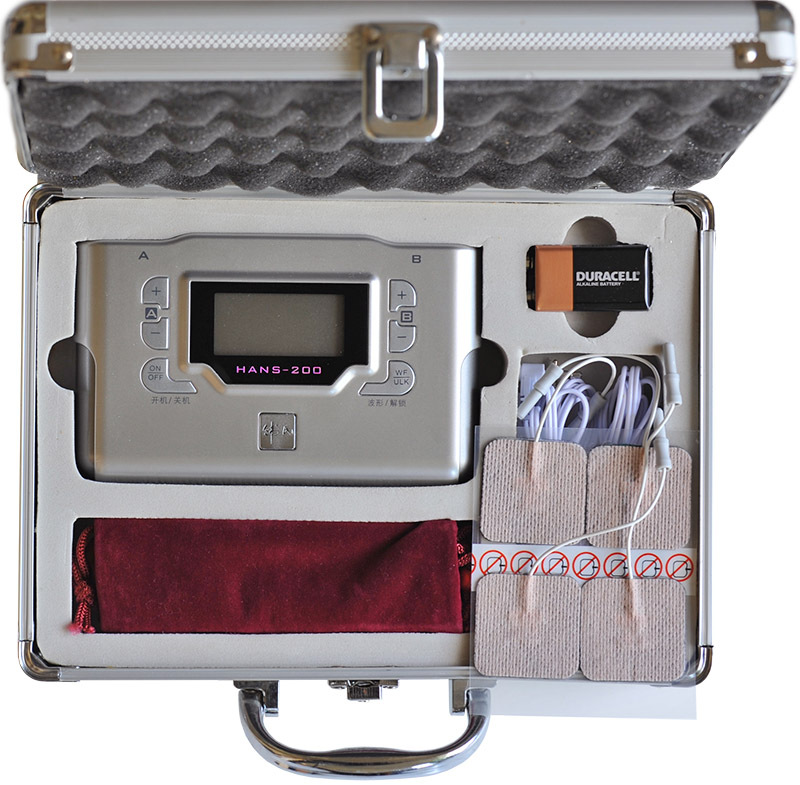 HANS® is a Transcutaneous (needle-free), Electric Acupoint Stimulator (TEAS). It combines the ancient healing technique of acupuncture with modern science and technology. Through adhesive skin electrodes placed on acupoints, gentle electrical stimulation at certain frequencies mobilizes the body's own natural healing processes to restore biological balance. HANS has been used as a standard TEAS device for numerous research studies. In addition to treating pain and addictions, recent clinical trials demonstrated efficacy in treating autism, infertility, insomnia, and depression. HANS can be incorporated into daily life to provide natural therapy known to be safe and sustainable for health maintenance and disease prevention. Pain is a major symptom in many medical conditions, significantly interfering with a person's quality of life. An acute pain may become intractable and develop into a chronic pain in which pain is no longer considered a symptom but an illness by itself. Repeated use of narcotic often leads to the development of drug addiction which is a complex and protracted health problem. HANS treatment helps to fight pain and addiction by inducing the production and release of the body's own painkillers such as endorphins. To treat pain, place one pair of electrodes on the area with pain (the "Ah Shi" point, meaning "Ouch"), and the other pair on selected acupoints. For different pain disorders or drug addiction, specific acupoints, frequencies, intensities, and treatment intervals are recommended. About one in three people suffer from insomnia of some form. Difficulty falling asleep at the beginning of the night is often associated with stress or anxiety disorders. Waking during the middle of the night and difficulty maintaining sleep is often associated with medical conditions such as pain disorder. Early morning waking is often a characteristic of clinical depression. Simple, effective and free of side effect, acupuncture is commonly used in treating insomnia. However, it is important to understand the root cause for insomnia before using HANS to treat the problem. To treat insomnia due to anxiety or depression, a low-frequency stimulation is recommended. A treatment interval of twice a week helps reduce anxiety and improve sleeping. For insomnia caused by pain, please refer to Pain and Addiction. Autism is a brain development disorder characterized by impaired social interaction, communication, and restricted and repetitive behavior. Autism involves many parts of the brain. How it occurs is not well understood. A recently published clinical trial [Zhang et al. 2012] indicates that after a 12-week treatment with HANS, autistic children of certain types (i.e. passive and aloof behavior) showed significant improvement over the control group. The changes observed in these children include improved communication, lowered anxiety and better control of emotions. Certain biochemical change was also detected in the HANS treated group. Most interestingly, such biological change paralleled with behavioral improvements. Treatment with regular 30-minute sessions per day for 2-3 months seems necessary to gain efficacy. Younger patients seem to respond to the HANS treatment better than the older patients. During the clinical study, most children accepted the treatment. In fact, after the treatment routine was established, some even asked their caregivers for it. The side effects of HANS therapy for autism are yet to be identified. Acupuncture treatment of female infertility has a long history in China. The mechanisms of effect have been purported to be the modulation of the autonomic nervous and neuroendocrine systems, and increased local blood supply to the ovaries. To improve the internal neuroendocrine balance and local blood supply, we recommend low frequency stimulation to certain acupoints. In order for the therapy to be more effective, we recommend applying HANS® treatment daily for 12 weeks, only stopping the treatment during menstruation. HANS® treatment also helps to increase the success rate for women undergoing embryo transfer. Acupuncture points can be located by their relation to anatomical landmarks measured by "finger breadths". A finger breadth is obviously not the same for everyone, yet it is an accurate way of locating acupuncture points for every individual. Another way of locating some acupuncture points is by feel. Slight depressions in the skin can often be felt along some channels. On the dorsum of the hand, between the 1st and 2nd metacarpal bones, in the middle of the 2nd metacarpal bone on the radial side. In the center of the palm. When a fist is made, the point is where the tip of the middle finger touches. On the palmar side of the forearm, 3 finger breadth above the transverse crease of the wrist, between the two tendons. The WaiGuan acupoint is on the dorsal side on the forearm, direct opposite of NeiGuan. On the anterior of the lower leg, one finger breadth down from the anterior crest, and on the outer side of the tibia. The right leg is shown in figure. On the medial side of the lower leg, in the depression of the lower border of the medial condyle of the tibia. Crossing point of three Meridians. On the medial aspect of the lower leg, three finger breadth above the medial malleolus, on the posterior border of the medial aspect of the tibia. HANS units are available for research purposes only. Cables for pigtail-type skin electrodes. 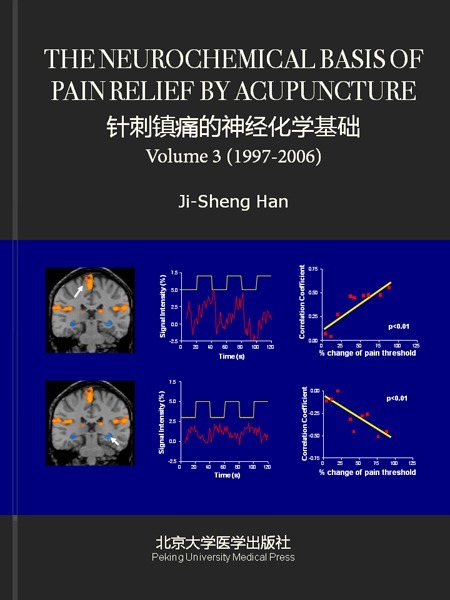 The Neurochemical Basis of Pain Relief by Acupuncture is a collection of research publications from Dr. Ji-Sheng Han's laboratory over 3 time periods. 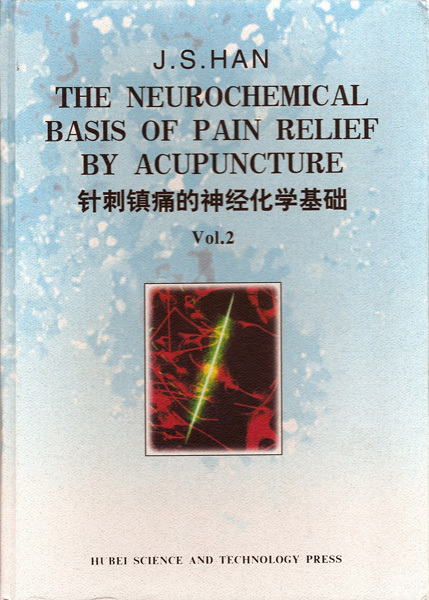 A 597-page collection of 141 research publications on the mechanism of acupuncture analgesia. It includes 44 English articles and 96 Chinese articles with English abstract. A 783-page collection of research publications, in which the scope of the research was extended to include the study of electro-acupuncture treatment of drug addiction and opioid modulation of cardiovascular activities. A 672-page collection of research publications in which the scope of the research was extended to include the study of electro-acupuncture treatment of Parkinson's disease and obesity. What health problems can benefit from using HANS? Why is acupuncture able to treat different disorders? Why is HANS effective in treating pain? Why is HANS effective in treating narcotic addiction? Is it better to use HANS more frequently? Would HANS treatment cause any side effect or addiction? What is the science behind the applications of HANS? What should I know before using HANS? Generally speaking, health problems that respond to acupuncture treatment are likely to respond to HANS treatment with the benefit of convenience and cost effectiveness. From extensive scientific research and clinical practices, HANS is shown to be effective in alleviating pain and narcotic withdrawal symptoms. A growing number of other health problems are found to respond to HANS treatment, such as autism, infertility, urinary incontinence, insomnia, depression, pseudo myopia, obesity, and addiction to smoking. It is important to follow treatment recommendations when using HANS to treat these conditions. Homeostasis is one of the most important physiological principles where sophisticated regulatory mechanisms keep the body in a biological balance in an ever-changing environment. Severe or prolonged deviation of the system beyond the set points may lead the body into a pathological state. Although the manifestations of diseases are different, they often share similar pathological pathways such as an imbalanced nervous system or confused immune system. Since acupuncture, by stimulating the energy channels, facilitates the body's natural tendency to restore homeostasis, it treats different disorders through self-healing processes. This explains the common observation that the effects of acupuncture tend to be more pronounced in the unhealthy (imbalanced) individuals than in the healthy (balanced) ones. Large doses of narcotic painkillers not only change the body's need for narcotics, but also severely inhibit the body's own production of endogenous opioid peptides. These are the main causes for withdrawal symptoms when the drug supply is interrupted. HANS treatment is able to relieve withdrawal symptoms and suppress craving by increasing the release of endogenous opioid peptides. After the acute stage of detox, it is necessary to continue the treatment with HANS twice a week or as needed in order to maintain a healthy level of opioid peptides. This is the key to prevent relapse. No. Multiple sessions or prolonged HANS treatment per day may cause the development of tolerance. One of the reasons is that a high level of endogenous opioid peptides will cause the production and release of anti-opioid peptides as a natural negative control mechanism. Unfortunately, anti-opioids reduce acupuncture effects. For acute pain or withdrawal symptoms, the recommended maximum total stimulation time is no more than 2 hours (4 standard 30 min sessions) per day for the first 3 days, and then reduce to 30-60 min of total stimulation time per day. A twice a week maintenance treatment is beneficial for chronic pain or drug addiction. In years of clinical practice with HANS, minimal side effects have been observed, and there has not been any report of "HANS-addiction". It is true that the use of HANS often generates a sense of well being due to its ability to induce the release of endorphins in the brain. However, the level of endogenously released endorphins is within the physiological range. It is enough to produce healing, but not enough to trigger a "high", so it does not lead to addiction and dependence. Scientists have discovered that signals of different frequencies transmitted to the central nervous system can induce the production and release of different kinds of chemical mediators. They also found that the functional balance between opioid peptides and the anti-opioid peptides in the central nervous system plays an important role in determining the effectiveness of acupuncture analgesia in different individuals. Scientific findings such as these form the basis for the design and applications of HANS. The analgesic effect of HANS treatment may cover up symptoms that need doctor's attention. HANS should not be used on patients with a pacemaker, unstable heart conditions, or active infection. Patients with undiagnosed pain, sensory disorders or pregnancy should consult a doctor about use of the device. Avoid placing the skin electrodes near the heart, in front of the neck or across the head. The electrodes from the same outlet should be at least 2 inches apart when placed side by side. 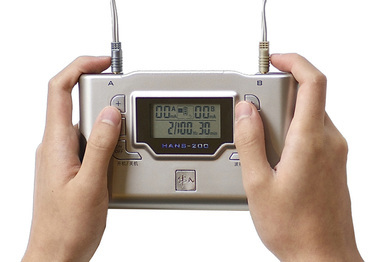 HANS should not be used in conjunction with other electric medical devices to avoid cross interference. HANS should not be used near instruments using high frequency, short wave or microwave radiation. Young children need an adult's supervision during the treatment. The content in this website is under the scientific supervision of Professor Ji-Sheng Han and the technical supervision of Professor Yi-Ming Liu. Professor Han is a member of Chinese Academy of Sciences, and served as an advisor of US National Institute of Health and World Health Organization. He is world-renowned for his decades of scientific research on the mechanism of acupuncture analgesia and treatment of drug addiction. His recent focus has been on treating protractible health problems such as insomnia, depression, autism, infertility and urinary incontinence with the HANS device. Prof. Yi-Ming Liu is an accomplished aerospace engineer. He is responsible for the design of HANS device - the transcutaneous electric acupoint stimulator (TEAS). Our mission is to promote a science based, safe and sustainable therapy with the HANS device for health maintenance and disease prevention. "With a severe case of neuropathy, I have been unable to wear enclosed shores and socks—even clothing touching my legs was painful. No one was more skeptical than me after all the years of many different methods of treatment. With HANS treatment I was able to gradually but dramatically decrease the dosage of oral opiates for my pain. I cannot thank you enough for introducing this natural and effective therapy to me." "I wish to thank you for your help with my mother. She noticed the greatest change four days after starting HANS treatment and was able to discontinue the use of PM opiates. Since then, she has continued to improve and suffers less pain and milder symptoms of withdrawal. She does not wake up at night as she used to and has more energy during the day." "For years, insomnia has been my mother's major source of frustration. She suffers from shallow and interrupted sleep and depends on sleeping pills to get by. Ever since she used the HANS unit, she enjoys deeper and longer sleep without any side effect. She asked me to thank Dr. Han for introducing HANS to her life." "We tried many kinds of treatment for our autistic son but none of them showed a significant effect. We had given up hope. Since we tried the HANS unit when he was 12 years old, amazing changes started to happen. He had less temper tantrums, accepted a varied diet, and most of all, he now responds to instructions. All of this happened about three months after the treatment began. His progress has brought so much joy to our family." 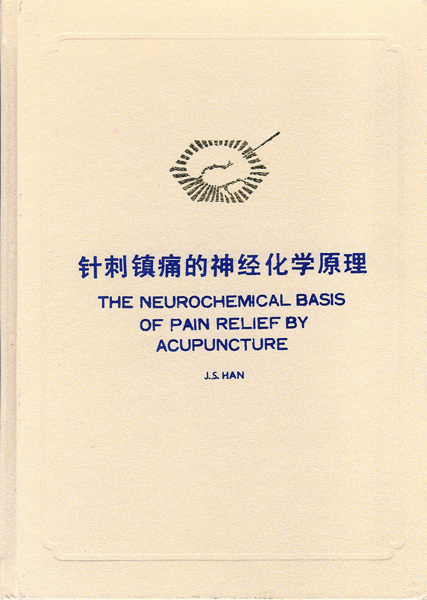 Han J.S., Terenius L. Neurochemical basis of acupuncture analgesia. Annu Rev Pharmacol Toxicol. 1982;22:193-2202. Han J.S. A mesolimbic neuronal loop of analgesia. Advances in Pain Research and Therapy. 1987; 10:219-243 Han J.S. The role of CCK in electroacupouncture analgesia and electroacupuncture tolerance. In: Multiple CCK Receptors in CNS (Dourish CT, et. al., Eds) Oxford, New York, 1992, pp 480-502 Han J.S. Acupuncture activates endogenous system of analgesia. NIH Consensus Development Conference on Acupuncture. November 3-5 ©1997 National Institute of Health, Bethesda, MD, pp55-60 Wang, B.G. et al. (1997) Effect of the intensity of transcutaneous acupoint electrical stimulation on the postoperative analgesic requirement. Anesth. Analg. 85, 406-13 Hamza, M.A. et al. (1999) Effect of the frequency of transcutaneous electrical nerve stimulation on the postoperative opioid analgesic requirement and recovery profile. Anesthesiology 91, 1232-8 El-sayed, A. et al. (1999) Percutaneous electrical nerve stimulation for low back pain. A randomized crossover study. JAMA 281, 818-823 Hamza, M.A. et al. (1999) Effect of the duration of electrical stimulation on the analgesic response in patients with low back pain. Anesthesiology 91, 1622-7 Hamza, M.A., et al. (2000) Percutaneous electrical nerve stimulation: a novel analgesic therapy for diabetic neuropathic pain. Diabetic Care 23, 365-370 Ji-Sheng Han (2003). Acupuncture: Neuropeptides released by electrical stimulation of different frequencies. Trends in Neuroscience, 26, 17-22 Ji-Sheng Han, Alan I. Trachtenberg, and Joyce H. Lowinson: Chapter 49: Acupuncture. Substance Abuse; August 24, 2004 21:16 Joseph Helms. Acupuncture Energetics: A Clinical Approach for Physicians Zhang, R., et. al. (2012). Transcutaneous electrical acupoint stimulation in children with autism and its impact on plasma levels of arginine-vasopressin and oxytocin: A prospective single-blinded controlled study. Research in Developmental Disabilities, 33, 1136-46. Zhang, R., et. al. (2011). 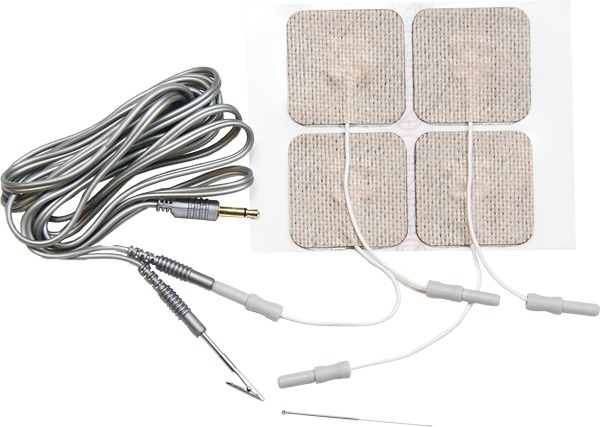 Increase of success rate for women undergoing embryo transfer by transcutaneous electrical acupoint stimulation: a prospective randomized placebo-controlled study. Fertility and Stability, 96(4), 912. Copyright © 2013 HANS Therapy Co., Ltd. (无锡神平心泰医疗科技有限公司). All rights reserved.